One of the most exciting holiday opportunities in The Cotswolds is within the The Lakes by YOO. The Lakes is a property development orchestrated by renowned designer Philippe Starck and property developer John Hitchcox. This estate features luxurious, architect-designed homes built on the water. A limited number of these stunning properties have been made available for luxury holiday rentals. 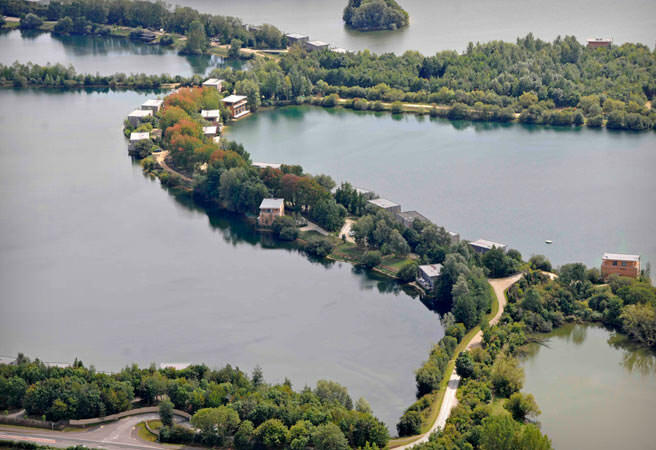 The Lakes by YOO are located within a private 650 acre Cotswold estate, only 90 minutes from London. The properties are situated around a series of beautiful clearwater lakes that are used for various recreational actives. The estate is also surrounded by natural woodland which provides a great deal of privacy for holiday makers and residents. Each luxury home sits adjacent to a lake and their open plan designs allow for uninterrupted water views. 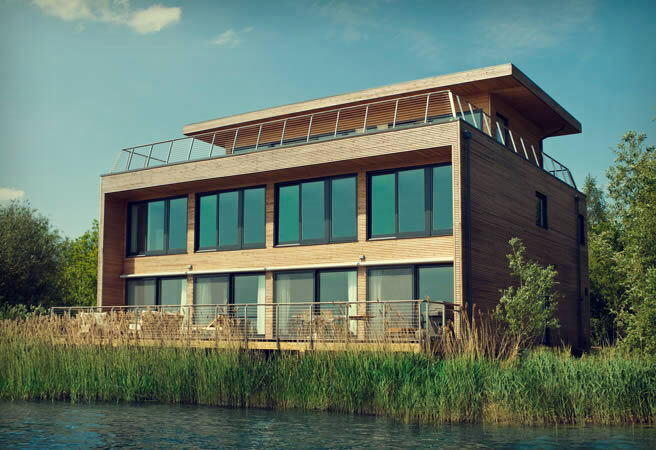 Architects and designers have created homes that integrate well with the natural environment and get the most out of the natural beauty in which they reside. There are dozens of activities to enjoy while staying at The Lakes by YOO. For the more active visitors there is windsurfing, sailing, biking, hiking, swimming and canoeing. There is even a zip line for the really adventurous holiday makers! Those who wish to take a more relaxed approach might decide to enjoy some fishing or perhaps a casual stroll. The estate features over 15 kilometres of lakeside pathways to explore. For those seeking a very laid-back holiday experience, “The Orchard Spa” is only a short stroll away. This luxurious day spa features an indoor swimming pool, steam room, sauna and gym. Visitors can relax while having a manicure, pedicure, facial, massage or one of the many available beauty treatments. While the parents are relaxing, the children can enjoy the adventure playground, entertainment area and basketball court. There is even a zip line for the really adventurous holiday makers! Situated between the towns of Lechlade on Thames and Fairford, The Lakes by YOO are centrally located within The Cotswolds. Many attractions are within a short drive of the estate, including farmers markets, charming pubs, heritage listed buildings, antique fairs, village fetes, cheese makers, wineries and more. There are three categories of luxury property rentals available: Lodge rentals (2753 Sq Ft), Lakehouse rentals (3300 Sq Ft) and Bowmoor rentals (5000 Sq Ft). Situated on Lake Bowmoor, this south-facing property sleeps 6 adults and 3 children in 3 double bedrooms and 1 bunk room. A downstairs sofa bed can allow for two more guests. 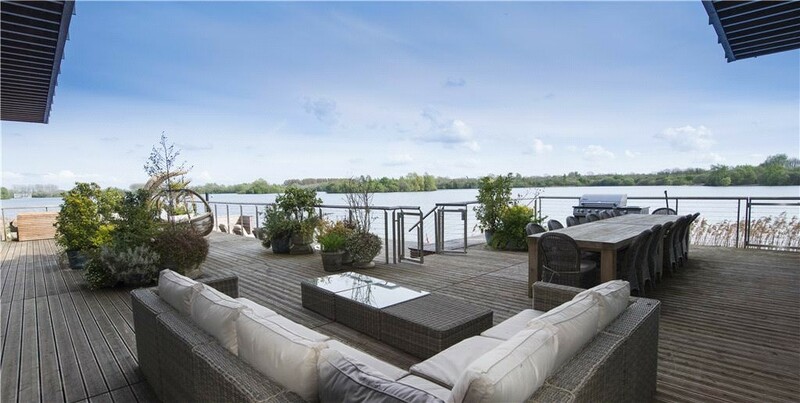 This beautiful home features a cinema room, log burning fireplace, huge terrace and private dock. This lodge sleeps 8 people within 3 upstairs bedrooms and the downstairs play room. It is also south-facing and features under floor heating, a wood burning stove, a large outdoor BBQ, multiple flat screen televisions and a private rowing boat. Situated on Longdoles Lake, this beautiful home sleeps 8 adults in 4 rooms. A sofa bed allows 2 more guests to stay. The large terrace has an outdoor dining table that seats 10 and a gas BBQ. This lodge also includes 2 kayaks with life vests and five bikes. This Warrens Cross Lake lodge has 3-bedrooms, 3 bathrooms and sleeps 6 people. It is very close to the beach, trampolines and zip-wire which make it a great house for families with young children. The house also has a log burner and large deck to relax on. Situated on Bowmoor Lake, this lodge has a massive deck, log fires and a relaxing dining space. The house sleeps 10 people at full capacity. 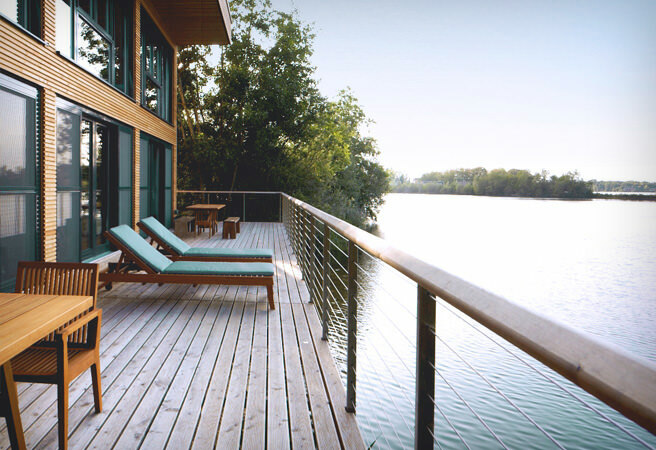 Featuring a 500 Sq Ft balcony, this lakehouse has plenty of outdoor space in which to relax. Huntsman’s Lakehouse can sleep 6 adults and 3 children over 5 bedrooms. The master suite is absolutely stunning and features a sitting room with log fire. The Orchard Lakehouse has a very modern and chic design. Very close to the Orchard Spa, this residence is perfect for those interested in relaxation. The kitchen has 2 ovens, 2 dishwashers and is designed for a holidaymaker who is passionate about cooking. This home features a massive master suite and can sleep 8 people in total. This lakehouse has a very modern and contemporary design. It is a substantial building that is perfect for entertaining. The large dining table can sit twelve people and there are two large sitting areas inside the house. There are 5 lake-facing bedrooms over two floors and bunk beds for the children. This home sleeps 10-12 people. This 3 storey home has over 5000 sq. Ft of internal space and two huge terraces. This open plan home includes 5 bedrooms and a top floor that can be used as a master bedroom or entertaining area. Elysian Estates are a locally based luxury rental property company who provide many properties on the lakes, for more information head over to Elysian Estates – Lakes by YOO.